What is the Difference between Air Charger Iron Filters and Maxi-Vent Air Compressor System Iron Filters? For a Birm or Pro-OX iron filter to work properly, there must be enough dissolved oxygen present in the water to help assist the filter media to oxidize iron and manganese particles for filtration. A good way to achieve oxidation without having to install an open atmospheric pressure storage tank and additional booster pump is to aerate the water by passing it through a head of air as it enters the iron filter tank. The air can either be injected with an external air compressor, as in the Maxi-Vent systems, or it can be drawn in during a backwash cycle, as in an Air Charger system. An air charger is simpler and will require less maintenance than a system with an external compressor, since the whole oxidation process occurs in one tank. Air charger systems function by drawing in air during their backwash cycle and keeping a pocket of air above the filter media to oxidize iron and manganese. The air charger iron filters that we carry come equipped with a Fleck 2510-SXT air injection control head that automatically backwashes the system daily to clean the media and flush out particulate in addition to drawing in air for oxidation. 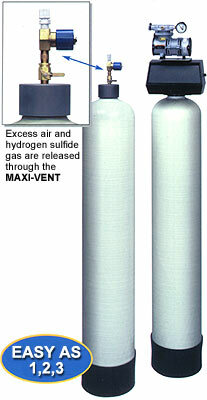 Maxi-Vent air tanks, on the other hand, function by pumping air into a filter via an external compressor. While an air charger filter will only filter about 7 – 8 ppm of iron and hydrogen sulfide, a Maxi-Vent system can filter from 5 – 20 ppm. Because the Maxi-Vent system has a separate air tank and compressor, one can always be sure that there is a head of air in the filter tank for aeration, without the need to run a backwash cycle every night. Another method of oxidation would be to use a chlorinator system before your iron filter. We have covered this method in previous blog posts, and we also have more information about oxidation by chlorination on our resources page. 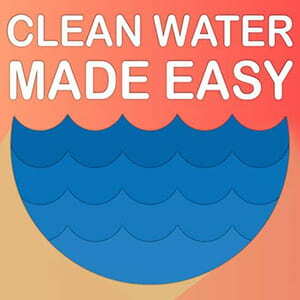 Don’t forget, you can send any questions or comments about water and water treatment to [email protected] or to our Facebook page. Thanks for reading!